By Hand: Put a small amount of product onto the included applicator and apply with light, small circular motions. Note: COSMIC V2 goes a long way, a very thin layer is sufficient. Curing: Let COSMIC V2 harden for 30 minutes and buff off residue with a clean dry microfibre towel. The surface should not be exposed to water or moisture for at least 12-24 hours. With the use of an Infrared Heating Lamp, the curing time can be decreased to 6 hours (instead of 12-24 hours) with a surface temperature of 35 degrees. The Infrared heater should be used within the first 15 minutes after application. For optimum performance, COSMIC V2 can be re-layered after two hours. Specific binding receptors ensure perfect cohesion. Plastic Trim: Using the included applicator, apply a small amount onto the surface in a circular motion. 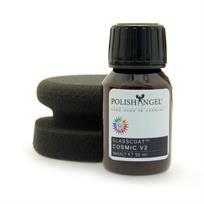 After about 30 minutes COSMIC V2 will bond completely with the trim and buffing off is not required. After Care: It is recommended that the vehicle be washed with Polish Angel FLAKE.